So...Karen HouseGuest and I had spent several hours out looking at wildflowers on the land, while I kept reminding both of us about snake safety, since it's the season for rattlesnakes to come out of their dens (and we've seen them the past two weeks) and wander around looking for food and mates. We had come back in the house. She discovered that the camera I'd lent her had the wrong settings, and after we reset it, she took it back out--just beyond the back yard--to check how it handled a bluebonnet growing in the north horse lot. It was safe that far. Surely. Karen did the right thing. She stopped. She did not step on it to see if it was alive. But, having camera in hand, she took its picture for later study. The snake did not like the sound of the camera. ....was seriusly upset. Luckily, she was far enough away...this is with a zoom lens. 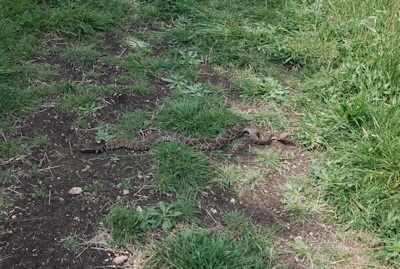 We've got a different variety of rattlesnake, and I've only seen them over by the creek. But I'll be extra careful, if this is the season that they roam around. I've spent some time in the rural Philippines, and there, the cobras come out at night. The roads are full of then, and they're quite deadly. We see them most in spring (after it warms up enough) and fall (as the days chill and they're on the move back to their den), but we see them sporadically all through the summer--from last frost to first frost, for sure. So we're wary most of the year--and extra careful for a couple of months in spring and a couple of months (October/November) in fall. We've found a cottonmouth and three timber rattlers out here. The cottonmouth was relocated and the timber rattlers are in the freezer. I'm kind of "meh" about the flavor of reptile & amphibian flesh, though as a kid I rather liked fried froglegs. 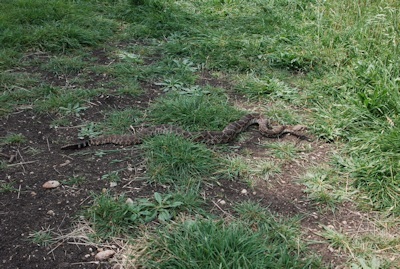 I have tasted rattlesnake (don't know which species) and thought it was OK, but not something I'd go looking for. Maybe it wasn't cooked properly. I think I enjoy it more for nostalgic reasons. When I was five, my dad brought home a very large diamondback rattlesnake. He coiled it up on the pan as though it was ready to strike and baked it. My mother, who hates snakes, refused to cook it. It was fun to eat because the piece wrapped around my little hands. I remember seeing the skin mounted on a board in his office for many years. I think he finally lost it when the tornado hit his house. 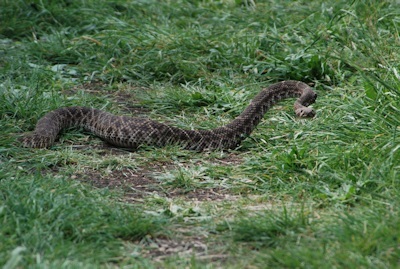 Tomorrow I am heading to the annual Waurika rattlesnake hunt. For such a small town, it's a very large event. I go mostly for the festivities. And a very steady hand. My uncle Swede (Katemcy, Texas) had the most beautiful belt made from rattlesnake skin. He also had a great many rattles as part of a sort of wind chime. My stepdad retired to Orange County in Florida, and kept a nine-shooter loaded with ratshot by the door. He always, always checked the porch and yard free of crawlers before exiting the house, and had killed more rattlesnakes than I want to think about. I've retired to Virginia, where there are rattlesnakes, but all I see are copperheads. I try to be PC about it, but "thou shalt not suffer a snake to live" sounds like an excellent motto for poisonous snakes. Snakeskin, including rattlesnake skin, can make beautiful belts.